"Higher - faster - further" are general superlative forms, whose origin in this form is in sports, and which often describe the typical aims of today’s society. In the AV industry, we are however dealing far more frequently with a further superlative term - “more”: more functionality, more interactivity and connectivity, and in recent years the constant more and ever more resolution. For a few years now everything has revolved around the 4K theme – the currently accepted superlative. Fraught with initial transmission challenges, as is often the case, this now appears in many places to be under control, and thus even the most complex content today allows display at a vast distance from its source. Particular challenges arise however, where requirements include remote operation of such sources in addition to pure AV transmission. Because as long as sound and image arrive synchronously at the workplace (keyword lip sync), latencies during transmission are to a limited extent entirely permissible, as they are simply not perceived by the user. The situation changes if another component is added: the return channel. Latency parameters are far more tightly limited when ensuring an optimal user experience. Already a delay of > 100 ms can result in, for example, a visible mouse movement, and from delays of > 250 ms between input and feedback (via the video signal), a system is considered no longer fluently operable. These are values ​​which KVM manufacturers have to consider in depth; because, unlike pure AV transmission, only a delay-free system enables a good user experience. Thus the German manufacturer Guntermann & Drunck has also intensively occupied itself with the optimum operability of its systems for decades. And this starts with video performance. When considering video performance, the initial question arises regarding compressed or uncompressed transmission. 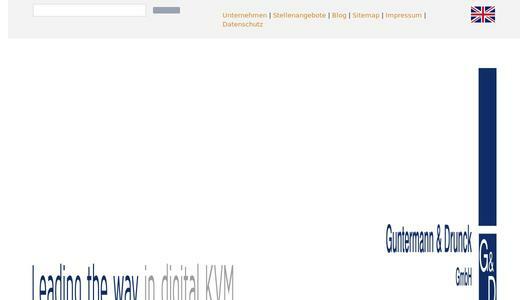 Of course, the best case scenario is transparent transmission, in which the image data remain totally unaffected. In many places however, external circumstances give rise to the need for a compression method, in particular when transmission media limit bandwidth. Thus uncompressed video signals of 4K and upwards at full frame rate require transmission via fibre optic cable, in order to ensure sufficient available bandwidth. In contrast, classic CAT cabling offers cost advantages – however due to their substantially lower bandwidth, also require corresponding compression. At Guntermann & Drunck they rely on an own compression algorithm, to keep development of this core aspect within their own control. In this way, the manufacturer can quickly adjust the transmission standards to changing requirements, and existing systems can be expanded to include new signals. Thus this compression achieves transmission of high quality video data – and, crucially – the return channel to the source operation remains free of latencies in the process. Ultimately there it is no generally applicable answer to the question, whether an installation should be built on compressed or transparent systems – as this is far too dependent on the application and the given infrastructure in individual cases, and not least, on the installation budget also. For this reason, G&D offers both: KVM extenders for transparent video transmission of up to 4K @ 60Hz, such as the “DL-Vision” – but also high-performance systems that use their in-house HDIP compression method in its most recent development stage, level 3. But high-performance hardware and good video performance with latency-free operation are only the start of a good KVM system. Installations frequently grow into powerful control tools and, as such, require a suitable range of functionality so that the system can be operated as simple as possible. Thus for some time now we have seen systems, which can be switched by easily using the mouse pointer: a range of sources delivers their content to a work place with multiple monitors. This setup can be operated with only a single keyboard and mouse combination. Formerly, switching the operating focus from one computer to the next required a button press or keyboard shortcut. Today this can be done by simply moving the mouse: move it over the screen edge, and the KVM system will automatically switch keyboard and mouse focus to the source of the respective neighbouring screen. Thus the user does not have to worry about the background infrastructure – but can instead keep track of his tasks and work intuitively, as with a virtual desktop. 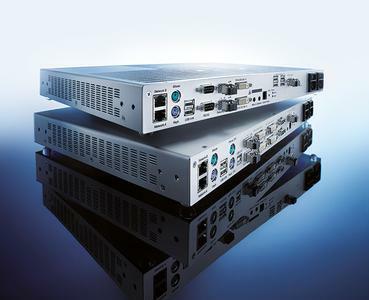 G&D has now perfected this functionality: Right from the start, the CrossDisplay switching was not limited in the number of integrated screens, and so now also computers with multi-head graphics are supported. Thus, an unlimited mix of scenarios can be switched from all sources and the user always operates in the visible area and never “flies blind”. The configuration is easily adapted to the screen arrangement, and thus does not need to be strictly ordered in row or one above the other. 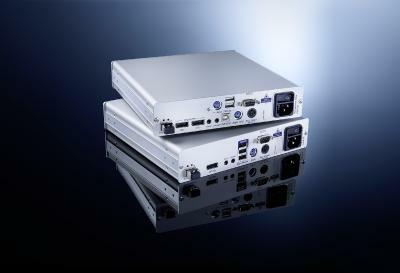 Also in combination with a multiviewer, the flexible CrossDisplay switching can significantly simplify the application. To quickly call recurring switching states in such installations, G&D now offers scenario switching. In control room applications in particular, where you can access a wide range of computers, this makes it significantly easier to operate the system. Thus switching states for computer constellations for specific tasks can be easily stored. This allows you to simultaneously switch sources for multiple consoles with a single command. 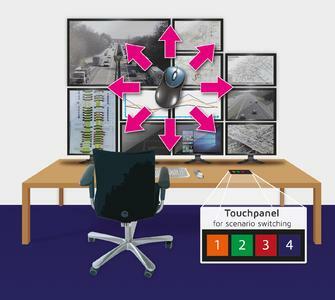 Ideal when an entire control room, for example, needs to be changed from day to night shift, or when a very specific computer scenario is required at a work place for fast task changes. In addition to the integrated features for the most intuitive operation possible, G&D systems also offer the option of external control. These can for example be operated via a graphically designed touch panel, or even integrated into the overall design of a media control. 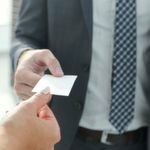 Here the applications are virtually limitless, and you can create unique designs, in which the installation once again does its job entirely in the background. The user retains just two aspects: full control – but without having to manage the infrastructure in detail; and full concentration on the application process itself! 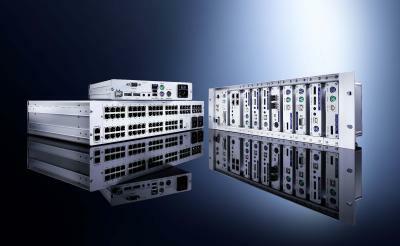 The overall performance and full functionalities of G&D KVM systems are on show at ISE 2016. Stop by stand 10-K153, where “a bit more” is possible.